I believe parents of any gender should all be represented fairly in children’s books. Of course, parents are often written out of the story entirely so that the children can get on with adventures, but in stories where this isn’t necessary I see far more single mother families than single dads. Or, if both parents are shown, the dad will be at work or behind a newspaper while mum gets on with all the caring duties. Not only does this misrepresent the role that the majority of dads do play in their children’s lives, it also gives a narrative to children that girls are caring and boys are strong. As part of a diverse society, this representation should not be the sole gender experience that children are exposed to. Here are six picture books which are all wonderful reads, and also include hands on and single dads. 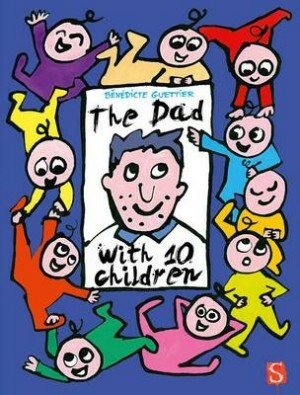 The Dad with 10 Children is a bright, colourful book which cries out to be read. The repetition in the text makes it suitable from a very young age. Scribblers have published this in a slightly-larger-than A4 format allowing clear reading for early readers, and lots of space for the illustrations. The illustrations are deceptively simple and may encourage children to copy the style. Dad is the primary carer, and from his expressions he clearly loves his children. Children being read to may wonder how he could leave, but delight in his return. It might also plant a seed to how hard their parents and carers work to care for them. 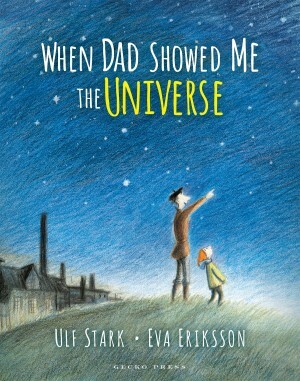 Possibly not one to read to a child fearful of being left, but a gorgeous exploration of parental love’s ups and downs. A dad takes his child for a walk to see the universe. The child notices every tiny thing – specks of blood on dad’s dentist coat, closed park and shops, a snail, a blade of grass… The dad wants to share his knowledge of the stars and the amazement he feels of being tiny in relation to the universe, but the child finds amazement in every small thing. The dad thinks he’s failed in creating a memory for the child, but the child has had a wonderful time with dad and will remember forever. 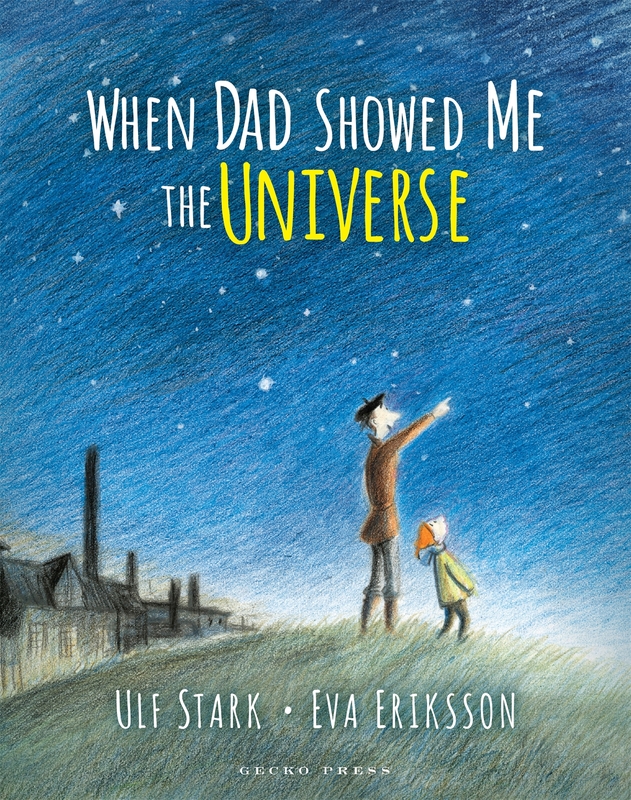 When Dad Showed Me The Universe is a stunningly beautiful book and we could just absorb the illustrations for hours. It’s a story to remind parents that children find wonder in all the small things, and we should too. It’s a story about a father and child spending time together, and children will relate to seeing all the small details. Plus there’s a huge laugh when dad steps in something smelly. Although the child is depicted in a traditionally male presentation, no personal pronouns are used so the child being read to (or reading) can decide whether to relate to the child in the story as themselves or as a friend. The family is a traditional mother/father set-up, but the story is about time with dad. 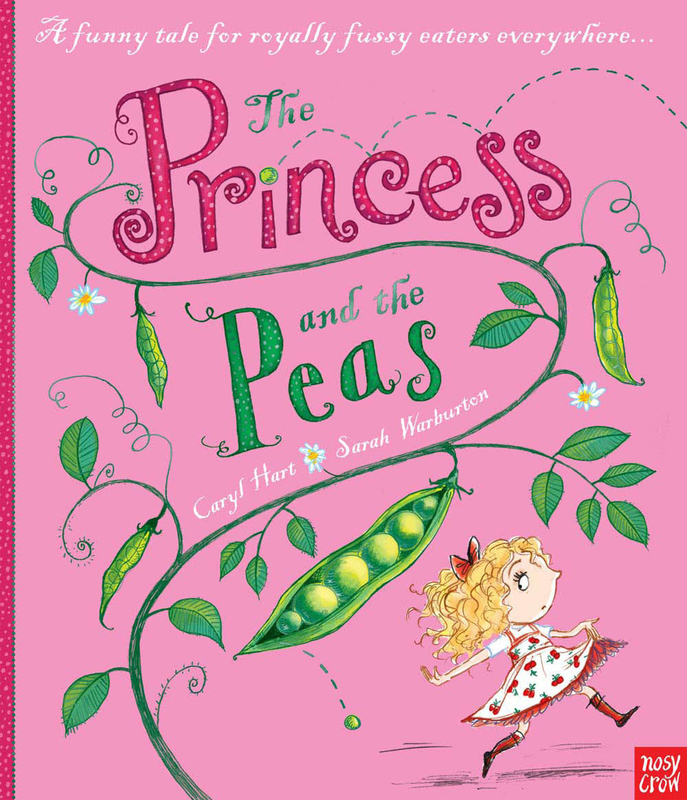 The Princess and the Peas is deceptively pink. Beneath the exterior is a tale of family love, caution for wishing for a different life, and healthy eating. Lily-Rose lives happily with her father but on discovering she dislikes peas, a doctor diagnoses her as being a princess. Lily-Rose is whisked off to the palace, which appears to be full of all the accoutrements a girl could wish for… Or does it? Is palace life a dream, or is dad best? It should come as no surprise that Lily-Rose returns to her loving home life at the end of the story. The Princess and the Peas is one of our all time favourites at Chassis Castle, there is so much to see in the little details in the illustrations; the rhyming works perfectly; it shows the more honest work in being a princess; and its a beautiful father/daughter sharing story. It’s George’s birthday and his parents agree to buy him a lizard from the pet shop. 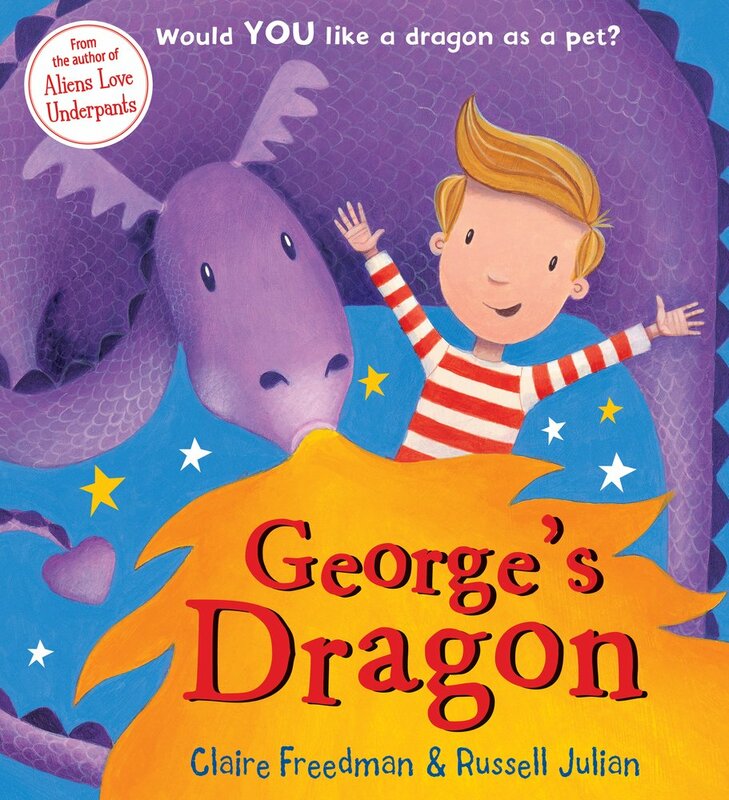 The shopkeeper clearly says Sparky is a dragon, and the pet guide does list some downsides of a growing dragon (baby – grow; flying – crash; fire – burn…) but George and Sparky are best friends. When mum and dad get fed up of the mess and want to take Sparky back to the shop, can George convince them to let his friend stay? George has two parents, and both are included in the story. They are both a part of his upbringing, making decisions together. Mum goes to work, and dad is the primary carer. All this is not presented as an issue, but a natural party of family life. An excellent fantasy tale for all those children who really want a pet. Dad is an inventor, and has invented a machine to make monsters. Together father and child fill the machine with icky ingredients and out pop monsters of all shapes and sizes. 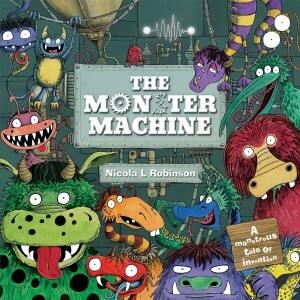 And what gorgeous monsters they are, Nicola Robinson’s illustrations are wonderful. The Monster Machine has a more traditional absent-minded dad, but the child is involved in dad’s work, and dad cares enough to come up with a solution to the monsters’ homesickness. Not an obvious dad-themed book, but a story we really enjoy, worthy of its place on the castle shelves. Little Red’s daddy barely appears in Little Red and the Very Hungry Lion, but he is at the start and end of the book. He’s important because he’s the only parent depicted, but this is Red’s story. 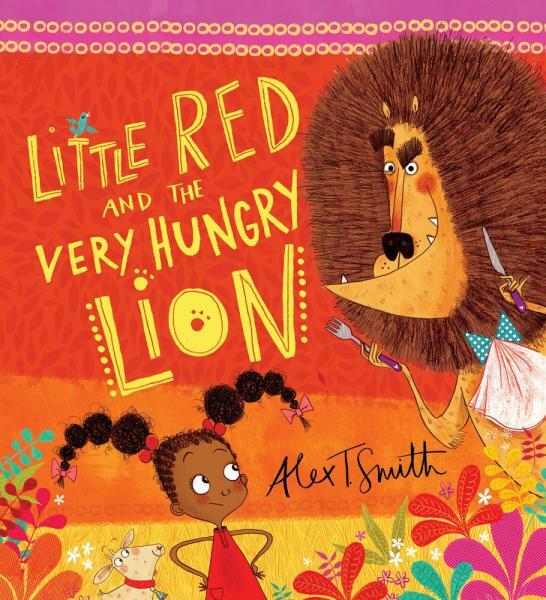 Taking the Little Red Riding Hood tale but having our heroine need no help in defeating the wolf lion puts this book on our “must read” list in itself, but Alex T Smith adds so much more that we want to put a copy in every house and library. It’s not just that it’s set in Africa, and has no white people shown. It’s not just the luscious illustrations that make you almost feel the heat, and hear the sounds. It’s not just the strong female lead. It’s that all of these exist without this being an “issue” book. 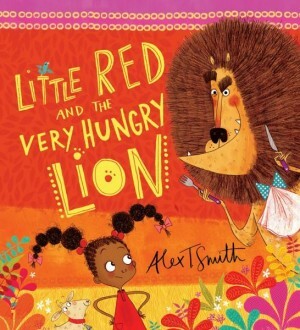 Little Red is a traditional tale, and the diverse elements are just there without a fuss. Which is why it’s included in this list about dads. Little Red’s daddy appears to be her primary carer, and this is as normal as it should be. Bliss. When choosing books from the castle shelves I found more books with single dads than I expected. However, many of these were in the feisty princess with not particularly useful king father theme. Useless parents are generally an acceptable portrayal so that children can win through, but I excluded those books to give more variety to the list. This list should give you a starting point to find books with dads as carers / single dads. If you have any suggestions to add, please use the comment form below.